Twitter: The 21st century’s answer to the telegram, this 140-character public messaging service forces you to keep your messages tight and focused. Twitter feeds are like headlines and should be written as such–or as short, punchy, attention-getting remarks that direct your audience (customers) to something even more interesting–like more detailed information about your company, products, or services. Twitter accounts can have a following of thousands or even millions. Readers are absorbing data miles wide a molecule deep. Facebook: In my mind–and yours may differ–Facebook is Twitter plus pictures and minus the 140-character message limit. You can do more “connecting” with Facebook, see the faces of your customers, or the images/avatars they choose to represent themselves. 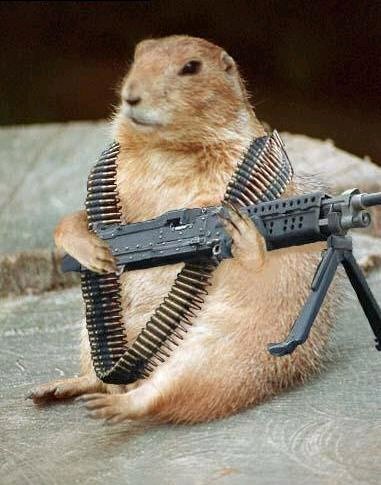 As ScienceCheerleader.com’s lead “go-fer” and part-time cheerleader bodyguard, my avatar most of the time is a gopher bearing a machine gun. FB also allows users to share jokes and pictures, group their connections by association (friends, family, work, people they met in Europe, etc.) and play online games (e.g., Farmville). Media/Press Release: I was informed recently that my use of the term “press release” is passé. It is now (at least in NASA parlance) a “media release,” since the recipients of said information are not just members of the print media, but television and the internet. This is an action-oriented document designed to call attention to a specific accomplishment by your organization: a new product/service, a milestone reached (number of customers served, a new application of your product, a new customer now using your product), et cetera. There are differing schools of thought on how often you should communicate with your local or national media outlets, but they are often casting about for new content to fill the now-24-hour news cycle, so they must “feed the beast.” And, like most items written for news outlets, you want to use the inverted pyramid method of getting your point across. Surprise endings are nifty for short fiction, bad for pre–er, media releases. Again, keep thing short and snappy–no more than a page or so. Company/Product Website: Your website is your store front on the internet. It’s often the place people go first to learn more about your company or organization in depth. Much like a physical store, your web presence should be organized somewhat logically, with like products, services, or types of information grouped together so the new or returning user can find them easily. I’ve already discussed website usability elsewhere on this blog, so you’re welcome to go there for more tips, but the bottom line is that your website needs to be organized well, with a visually appealing and user-friendly interface. And, again, the writing on your website should be brief and focused on vital data to ensure that your users–your customers–can find what they want with a minimum of fuss. It’s possible that they might find exactly what they want by going to Google.com and searching for the keywords that will direct them magically to your product fact sheet, but can you take that chance? Fact Sheets/Detailed Reports: Okay, let’s say that your Twitter posting piqued someone’s interest. Your Facebook page teased them with a bit more information about your organization’s “personality.” It’s possible your potential reader has received a press release and read enough of your website to be seriously intrigued. Now they’re wanting serious details about your product or service: technical specifications, nutritional information, policy position, price, contact information. The fact sheet should show the information your customers need to take action. This is where they’re ready to come face to face with you, your staff, your product, your service, or your cause. Are you providing the right information and visuals that prompt them to commit to you? Welcome to the fact sheet, white paper, policy paper, or technical report. There are, of course, other aspects to internet marketing: everything from banner ads to popup windows to email blasts and viral videos, but this introduction will give you a hint of what you’re in for. In each technical communication/marketing product above, you move from larger to smaller audiences and from lower to higher information density/detail. However, in all cases, you need to be sensitive to your readers’ needs and habits on the web. You need to think Hemingway or Vonnegut, not Faulkner or Joyce, to use author equivalents. Make sure you’re getting the most bang for your buck as you create your online marketing content. This entry was posted in advocacy, audience, marketing, technical writing and tagged Facebook, fact sheets, media releaases, press releases, technical reports, Twitter feed, websites. Bookmark the permalink.